It comes as a surprise to many people that we have a system in our bodies capable of producing its own cannabinoids without you ever picking up a hemp or cannabis product. According to the Journal of Nature Reviews Drug Discovery, the discovery of this system occurred some time in the mid-1990s, after scientists found membrane receptors (known as CB receptors) used by the psychoactive compound delta9-tetrahydrocannabinol or THC. Some scientists thought that THC acted on individual body cells, but this discovery proved that notion wrong. As it is understood now, we wouldn’t actually get “high” from THC in cannabis plants at all if we did not have an endocannabinoid system. Other species in the world cannot get “high” because they lack this feature in their anatomy. According to the Journal of Comparative Neurology, such a system is common in many creatures including in mammals, birds, amphibians, fish, sea urchins, leeches, mussels, and even the most primitive animal with a nerve network, the Hydra. However, the presence of CB receptors has not been seen in terrestrial invertebrates (or any member of the Ecdysozoa). Surprisingly, no specific bindings of the synthetic CB ligands [(3)H]CP55,940 and [(3)H]SR141716A were found in a panel of insects: Apis mellifera, Drosophila melanogaster, Gerris marginatus, Spodoptera frugiperda, and Zophobas atratus. Another study confirming the endocannabinoid system in humans was one done on runners in 2003. This study showed that male college students running on a treadmill or cycling on a stationary bike for 50 minutes had their endocannabinoid system activated. This study was among the first evidence to suggest alternative explanations for exercise’s ability to induce analgesia, or “runner’s high,” in people. abnormal-cannabidiol receptors (abn-CBD) or anandamide receptor. Some might be yet to be discovered, since truncated forms of the CB1 receptor (like CB1A) have also been found. Also important is knowing where CB1 and CB2 receptors are generally located. According to an article in the Journal of Current Neuropharmacology, “CB1 receptors are abundant and widely dispersed throughout the brain. Their distribution has been mapped by autoradiographic studies, immunohistochemical techniques, in situ histochemistry, and electrophysiological studies. CB1 receptors have shown particularly high levels of expression in cortex, basal ganglia, hippocampus, and cerebellum and low levels of expression in brainstem nuclei.” In contrast, CB2 receptors are found mostly on white blood cells and in the spleen. 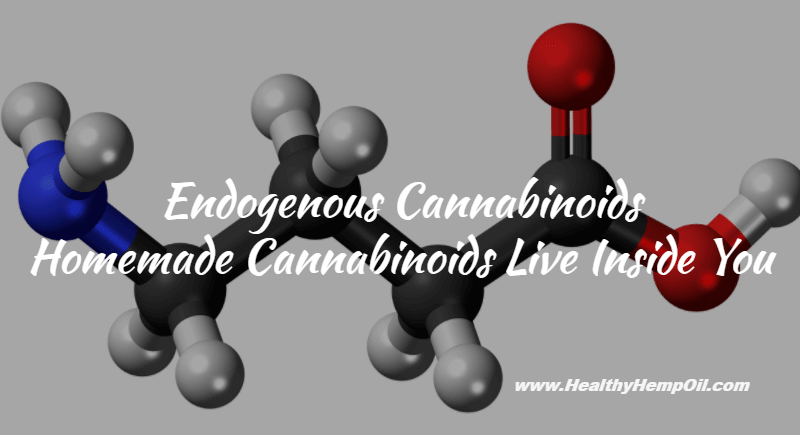 Endogenous Cannabinoids – What are these chemicals you make? First thing to know regarding endogenous cannabinoids is that they are synonymous with endocannabinoids. “Endo” simply means “within” or “internal” while “genous” comes from the same root word as “generate” or “genesis” – in other words, “make” or “create.” The words “endogenous cannabinoids” and “endocannabinoids” will be used interchangeably. Endocannabinoids serve as intercellular “lipid messengers” signaling molecules that are released from one cell and activating the cannabinoid receptors present on other nearby cells. The first endogenous cannabinoid to be isolated and structurally characterized in 1992 was arachidonylethanolamide, commonly known as anandamide, and it was taken from a pig brain. Fun fact: The name for this chemical comes from the Sanskrit word ananda, which means “bliss.” This study published in the Journal of Neurochemistry shows how anandamide works. Anandamide can bind to membranes in two ways. Either it does this transiently, quickly passing, or it does so when it is “transfected with an expression plasmid carrying the cannabinoid receptor DNA.” Transfection, in biology terms, is a method of introducing genetic material. An expression plasmid can affect the gene expression in cells. The anandamide also inhibits the forskolin-stimulated adenylate cyclase in the transfected cells. What all this means is that “anandamide is an endogenous agonist that may serve as a genuine neurotransmitter for the cannabinoid receptor.” Anandamide affects how CB1 receptors do or don’t get activated. Anandamide is synthesised by the hydrolysis of the precursor N-arachidonoyl phosphatidylethanolamine, which is catalysed by the enzyme phosphodiesterase phospholipase D. After release from the postsynaptic terminal, which is the receiving part of the connection (synapse) between two nerve cells (neurons), anandamide interacts with presynaptic cannabinoid receptors. Deficiencies can have unpleasant results, as this study about neuropathic pain in mice shows. Anandamide plays a role in pain, mood, appetite, and memory and is the most extensively studied endogenous cannabinoid. Like anandamide, 2-AG is also an endogenous ligand for CB1 receptors. According to a study published in the Journal of Neuroscience, it is the most prevalent endogenous cannabinoid ligand in the brain. The study, which observed self-administered injections of squirrel monkeys, also pointed to data suggesting that 2-AG plays a role in drug-taking behaviors. The monkeys were shown to exhibit an addictive behavior when given 2-AG. Its role in the organism overall is still being established, but recent studies show that it plays a role in the regulation of the circulatory system via direct and/or indirect effects on blood vessels and/or heart. It is synthesised by cleavage of an inositol-1,2-diacylglycerol, which is catalysed by phospholipase C.
This endogenous cannabinoid is a CB1 partial agonist but is a CB1 antagonist in vivo (in the body). It was discovered in June of 2002. Virodhamine is arachidonic acid and ethanolamine joined by an ester linkage. In the hippocampus, its concentrations are similar to those of anandamide. In peripheral tissues that express the CB2 receptor, however, it was found in amounts that were 2- to 9-fold higher than anandamide. At the CB2 receptor, it acts as a full agonist. It sometimes can antagonize other endocannabinoids in vivo; for example, it can inhibit anandamide transport. In a study published in the British Journal of Pharmacology, it was shown to relax rat mesenteric arteries through endothelial cannabinoid receptors. It can do this to the human pulmonary artery via two mechanisms: It activates the putative endothelial cannabinoid receptor, and it initiates the hydrolysis of virodhamine to arachidonic acid and subsequent production of a vasorelaxant prostanoid through COX. Here are some things you need to understand about how CBD relates to these endogenous cannabinoids. CBD is not itself an endogenous cannabinoid; however, it acts on CB receptors in a similar manner to some endogenous cannabinoids, like OAE. THC and CBD both influence the way that natural endocannabinoids carry out their jobs. Sometimes, they are agonists in one spot and antagonists for another. We want to know: How has this expanded your perspective on the usefulness of cannabinoids? Leave a comment. In order to understand more about cannabidiol specifically, we have a great resource page on our website that neatly compiles must-know facts so you don’t have to do the arduous digging. Please don’t hesitate to ask us any further questions. This entry was posted in Research & Science. Bookmark the permalink.